The finale of my first music series over on Sourcerer! These were a ton of fun to write, so I hope you’ve enjoyed them too. Fun to dip my toes into writing about something I know so little about! 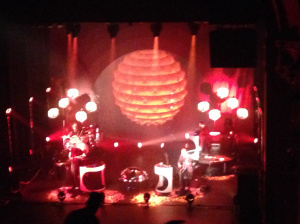 Last week I tried to talk through some of why I like the Broken Bells. They’re my favorite band; I hope some enthusiasm showed through! But I wanted to give a further look, to give a review of the concert I went to, to let you know where you can find the Broken Bells. Real photo – just not a real good photo! The last two of my music series on Sourcerer were on the Broken Bells – my favorite band! Will share those two posts today and tomorrow here! I’ve been holding off on writing much about my favorite band. I had a reason. I was seeing them in concert. I figured this would give me some insight, something new and interesting and different to talk about. And I wasn’t wrong. If you were to ask me who my favorite band is, I might have to think a bit. There are bands I’ve loved for a long time. Bands that have a large amount of good content, that keep being good. But really, if I were forced to answer, I would have to go with the Broken Bells. And maybe, just maybe, some of the hesitation also has to do with the fact that, when I name them, people tend not to know who the heck I’m talking about. The next of my music posts – this time on Guardians of the Galaxy! If you’ve seen this movie – and the box office figures suggest you have! – you know the music is an integral part. I suggest some reasons that the way they used music were really something! If you haven’t had a chance to see Guardians of the Galaxy yet, might I suggest checking it out? I have been blogging on Sourcerer about 2 things: comics and music. This movie is a perfect combination of those two things. Previously, it seems like it’s Zack Snyder who had a hold on good use of music in comic-book type movies, especially Watchmen and Sucker Punch. But those movies were a lot darker: Guardians of the Galaxy has great music, and used it to generate a sense of fun, as well as emotional depth. Next up of my music posts – lots of videos! How can you spot a one-hit wonder in advance? Incredibly difficult! I try to do it by spotting a few songs with a lot of parodies – like maybe our interest had more to do with our ability to repurpose the song than in the song itself! I’ve been covering bands for the lastfewweeks. Kind of like in a concert, when the band gets going, and plays a bunch of songs in a row without stopping. But it’s time to slow back down a bit, get back into a groove of talking about music, as well as bands. This week, I wanted to talk about one-hit wonders. Usually, figuring out what songs are one-hit wonders requires a good deal of time to pass, so that you can look back and say that, “yep, none of their other songs ever made it big.” However, I think that makes it fun to speculate about which recent songs will end up as one-hit wonders, as the artists fade into the night. Here’s the next of my music posts! Much like the music itself, writing the posts brings me a lot of joy, so I hope you like them too! Next up is Imagine Dragons, a great new addition to the world of music! Last week I wrote about Lorde, one of the sudden, big hits of recent years. She’s so young that some of the question is, how genuine is she, how much will she maintain who she is now into the future? She sings so much of being small, but has become so big that you have to wonder what the future holds for her. The discussion, about how genuine she is, and if it will last, got me thinking of a different band – another recent rise to fame. A band whose name and first full album I keep seeing listed as a top-selling album – 2 years after its release. 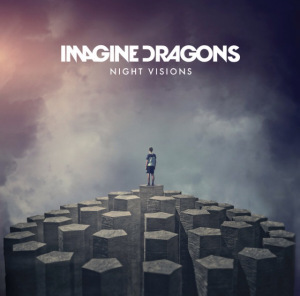 The album is Night Visions, and the band is Imagine Dragons. One of the better music posts I’ve written, because I really had some questions to delve in on – more than just recommending an artist. I would definitely still be interested in thoughts, so feel free to weigh in! You’ve probably heard of her. Award winning new artist. Young. New Zealander. Lorde. I found her through Pandora, when it started working Royals into my playlists. But I’ll get back to Royals. It’s what I’ve encountered in the rest of her music that makes me want to talk about her. She’s swept music by storm, and I have a few thoughts about why. If I were to sum it up at first here, it’s because the music is so smart. No, there’s a better word. It’s wise. Wise beyond her years. She’s 17. And at the age, she has the potential to become to voice of a generation – or to become the next fallen icon. But let’s take some time getting there! Here’s the first of three band reviews I did in a row over on Sourcerer. 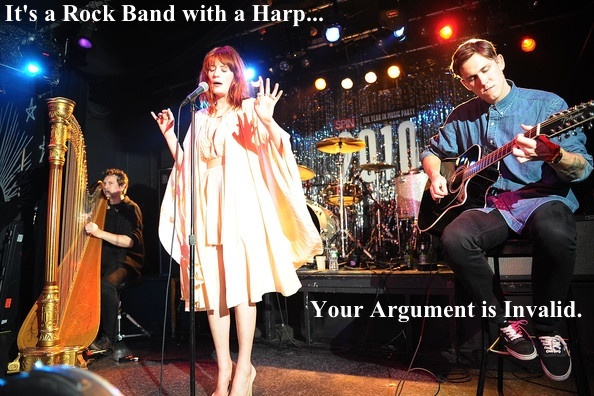 First up is Florence & the Machine – a band which I think is just a ton of fun. Let me know what you think! I’ve recommended a few other bands so far in my series on music, like The Lumineers and The Black Keys. Both of those bands have a simpler sort of sound, from a folk origin like with the former, or from just being two musicians with the latter. So how about a different sort of band? Florence & the Machine. It sounds even from the name like it’s a large thing. The sort of band where you might expect a song called Cosmic Love. Theirs can be both a large sound, and can focus in and be all about the haunting vocals of the lead singer, Florence Welch. Also, they have a harp.